It’s important to become competent in walking and trotting. This means we need to spend real time in the saddle, to develop the right posture and seat. We need to feel confident at the trot before going to the lope. We want to work to create trust between the horse and rider. The #1 way to do that is by showing the horse you are good leader, and will make good decisions. Janel explains her “4 C’s” of horsemanship: Comfort, Communication, Control, Confidence. Each attribute takes time and effort to achieve. These help evaluate where each student is in his or her riding skills. Once you accomplish the 4 C’s of horsemanship, you can take riding to any level: casual riding, a career with horses or competitive riding. 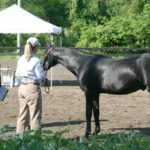 The video emphasizes that safety and functionality are the foundation of all basic western horsemanship and riding.